Even though I had been forewarned, I was probably still expecting too much. I had read last year both the books on which the movie is based, My Life in France by Julia Child, which I had found very interesting and quite endearing, and Julie and Julia, by Julie Powell, which I had found, well, less interesting and endearing. Let’s put it that way, I was glad Powell didn’t tackle volume II of Mastering the Art of French Cooking after she went through volume I. So I knew there was going to be an imbalance in the movie but still, I didn’t expect it to be so vivid. 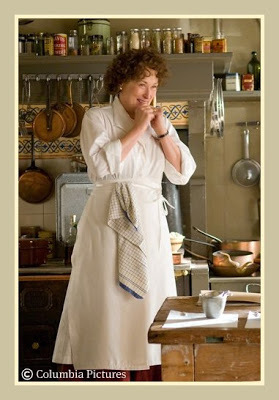 Of course, there is the Meryl Streep factor (she’s extraordinary as Julia Child) and the perfect fit between her and Stanley Tucci, who plays Paul Child. But then, while not in the same league, Amy Adams and Chris Messina, who play the Powells, are fine in their roles. It’s just that Julie Powell’s story is obviously nowhere as compelling as Julia Child’s. I left the theater hungry for more Julia, more France in the fifties (when I was growing up) and more about the feat of bringing French cooking to “servantless American cooks”. When Julia said “French people eat French food every day”, I thought of my Mom and the marvelous way she had with Sole Meunière (sole in a butter sauce), the very dish Julia Child enthuses about in Rouen at her first French restaurant, and I would have loved to know more about how she managed to introduce it to American kitchens. I should add that “sole meunière” didn’t feature weekly, or even monthly at our table when I was growing up. With four kids to feed, there is no way my parents could have plied us with such an expensive fish more often than once in a while for a special occasion but the point is that, when my Mom made it, the only thing we found remarkable about it is that we had sole at all, not that she knew how to cook it. We had “îles flottantes” (floating islands), boeuf bourguignon, coq-au-vin (chicken cooked in a wine sauce), crêpes (flambées or not), mousse au chocolat, asparagus, civet (rabbit or hare in a red wine sauce served with buckwheat crêpes), pâtés, terrines, pot-au-feu, baba au rhum and everything else on a very regular basis, especially because my grandparents lived in the country, raised their own chickens and rabbits and grew their own fruit and vegetables (and ours) , and because my Dad and his Dad hunted in season. But, to us kids, it was all a given. We thought nothing of it. Food was food. It was almost always good (I balked at lamb brain and my Mom didn’t offer it again) and we didn’t marvel at it, even though we thoroughly enjoyed it, just as we greatly enjoyed simple dishes, such as sliced ham with a side of pasta topped with grated Swiss cheese or soft boiled eggs with “lichettes” (buttered slivers of crusty baguettes). Eating as well as possible is (was?) in France a way of life. It was certainly our way as a French family. I wouldn’t say that we lived to eat (although my Dad might have argued the point) but I am quite certain that, for better or for worse, we didn’t eat to live. I know that the Joy of Cooking had already done wonders for American family fare by the time Julia came along but I would have liked it very much if the movie had focused more on what Julia had to do to convince American cooks that French cuisine was do-able and, more to the point, another step they might be happy to take. Julie Powell’s marathon does nothing to illustrate that process. 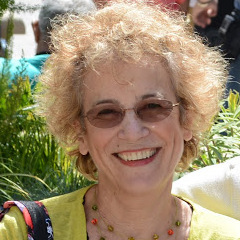 She cooks and writes and although much is made of the connection she feels with Julia Child, in the end, she cooks to be recognized as a writer. “Is there anyone out there reading me?”, she asks at the beginning of her adventure. Whereas Julia cooks and beams: “I am French”! And she is. And that’s the difference. At least for this French-born American baker. Great review, I used to watch Julia as a child along with Jacques Pepin, though I never met her, I always loved her vivacious and always interesting take on French food. Jacques Pepin though is my true culinary hero and have had the good fortune of working and meeting him as well as interviewing the chef! My mother though is my French cook, she taught me so much as I stood by her so often watching her cook her frugal but always delicious meals, and now I count you, MC, as another French inspiration for my own passion, baking! I have to get my hands on these old Child/Pépin videos, possibly through my library. How lucky you are indeed to have worked with Jacques Pépin and were able to interview him. That puts you two degrees of separation away from Julia Child. Amazing! I truly don't think you need me as a source of inspiration but I love the idea of a web of bakers spurring each other on throughout the world. Back in the 1980s, I was lucky enough to attend a one day cooking class with Julia in Boston. Afterward, she was gracious enough to sign any of her books that people in the class had brought. It was a wonderful class and Julia was just marvelous. What a wonderful memory to have! You were indeed lucky, Steve. I would have loved to meet Julia in person.